The Conversation: Challenging Your Student with a Classical Education is a book by Leigh A. Bortins. 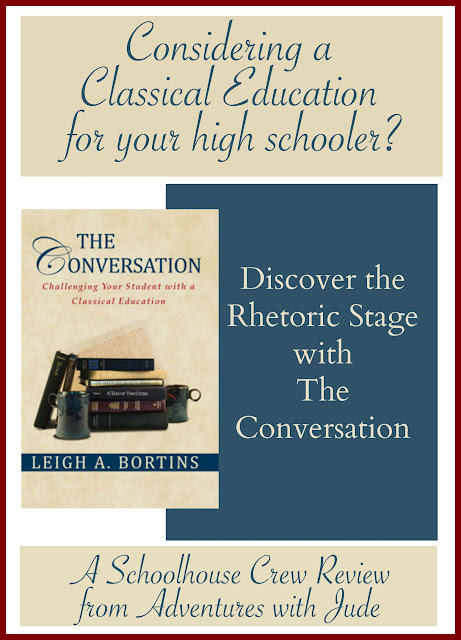 Published by Classical Conversations, this 254-page paperback guides a family through the transition into homeschooling high school. After graduating four classically educated sons, Ms. Bortins certainly has a wealth of experience with high school. When we started homeschooling, Jude was only in pre-school. The stakes seemed pretty low at the time, and I thought we'd slowly make our way out of the shallows towards high school -- if we were even still homeschooling by then. When rising-tenth-grader Luke joined our homeschool, we suddenly found ourselves in the deep end. I had no clue what to do, or what my official "homeschool style" was. Mostly, it was "survive today." I wish I had known then what I know now, including that I do seem to gravitate toward a "classical" model. What is a "classical" education? At its core, it's an educational model that teaches a student how to think. It's not about learning to pass a test, it's learning for the sake of learning. It's a liberal arts education, in its most basic form -- one that studies not just the "three Rs" but arts, sciences, history, and humanities. According to Bortins, a classical educator, "attempts to understand the arts of grammar (vocabulary), dialectic (clear reasoning), and rhetoric (wise choices) and their application to quality content, whether an ancient piece of literature or a new brownie recipe." (p 29) The younger grades (about Kindergarten through sixth grades) are immersed in the "grammar" level - learning to read, memorizing facts and rules, etc. The dialectic age is the middle years - around grades seven to nine - when students begin to naturally question what has been before simply accepted, and find a way to logically organize what they've learned. The final state - rhetoric - begins in the high school period (and ideally, continues for life). The rhetoric age becomes a time where speaking and writing come to the forefront; students take the skills and knowledge they have learned and begin to be able to effectively express a position. Now, as I said, I had no idea what type of "style" we were. I just knew I needed something for Luke, and fast, and we dove in. He has explored different writing styles with his series, Luke's American Adventure, and unwittingly pursued them from a classical perspective. As I read The Conversation, I found myself nodding and saying, "Yep, totally agree, " or "Hey! We do that, too." I gave up on trying to mentally take notes and just started adding post-its to the pages. I also knew that I didn't want to sit and grade worksheets and tests and papers when it came to teaching Luke. Sure, he needed grades for a transcript, but marking multiple choice questionnaires is not my idea of a fun night. If you were to look at his work, I will admit, there isn't a huge paper trail. Why? We tend to discuss things rather than take tests. This fits in well with the Classical model of being able to verbally debate and support an idea. Invention - Have you defined your terms and considered other answers, context, and/or bias? Arrangement - What side are you on? Can you defend it? Can you apply it to a real-life scenario? Elocution - Effectively arguing your position. Memory - Do you need to memorize specific facts to support your position? Delivery - Are you properly presenting your answer? Is it an appropriate presentation for your audience? I think having these basic concepts defined for multiple subjects, as Bortins does, really will help him tighten up his thinking. Throughout the chapters, she shows how to apply each of these canons to different subjects, from creating educated opinions on government to even writing poetry. Last year, when Matthew came home, again, we just dove in and hoped we could keep our heads above water. I am finding he naturally seems to gravitate toward a classical model as well. Because this book explains how to move from the dialectic to the rhetorical periods with not just reading and writing, but in science, math, history, fine arts, etc. I'm actually finding that it's difficult to plan Matthew's potential transcript because we are having so much interplay; is his ability to discuss ancient Greek architecture principles in an 1840s train bridge considered science or history? He is easily and naturally applying the canons to his discussions; I have to admit that it's a little embarrassing to say that while of course I thought my kid was smart, I had no idea just how intelligent he was. Clearly, he was learning in the past, but it all seemed "stuck." A classical model really allows him to apply what he knows, rather than simply regurgitating facts back. There is a reason that this style of education is called "classical" -- it's how people learned for thousands of years. While I feel like Luke and I managed to survive his Sophomore and Junior years, I really think having this book will provide me with a great resource for all of Matthew's high school career. (This is Bortins' third book about classical education. I am seriously considering adding The Core (grammar/elementary stage) and The Question (middle/dialectic) to the reference section of our bookshelf to use as guides for those stages of learning with the younger boys.) I used to think that a hands-on or visual style of learning excluded a classical one, but after reading this, I've changed my perspective a little. I think that these ways a student may absorb information most efficiently really are just ways to acquire a classical education. Because this book explains how to apply the canon to so many different and specific topics, it helps you teach your child to become an eloquent adult regardless of the his specific interests.